Do you hear an Echo? Because Samsung just announced Bixby 2.0, an update to its intelligent voice assistant, and it's moving in on Amazon Alexa's territory. Bixby is jumping from phones, like the Galaxy Note 8 and Galaxy S8, to Samsung smart TVs and refrigerators, and it's bringing natural language capabilities along the way, according to Samsung. Its voice assistant is poised to control the ever-expanding Samsung SmartThings device lineup in the future, from smoke detectors to security sensors to outlets. 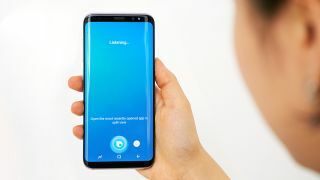 Samsung's goal is to open Bixby 2.0 to more devices and "create a predictive, personalized experience that better anticipate [users] needs." Sounds an awful lot like what we're currently experiencing with Amazon Alexa. Where's that Samsung Bixby smart speaker? Amazon has expanded Alexa from Echo speakers to smart locks, thermostats and air conditioners. Today it wound up in a new Moto X phone mod. But where's that promised Samsung speaker to compete with Amazon's flagship Alexa product? Samsung hasn't announced it quite yet. It's "coming soon," in the words of DJ Koh, the president of Samsung's mobile division. But that was said two months ago at the Note 8 launch event. Samsung's speaker with Bixby 2.0 would be going up against a lot of new rivals, including fresh Amazon Echo speakers, Google Home Mini and Apple HomePod, if is does come out in time for Black Friday 2017 and Cyber Monday 2017 – if it does indeed come out "soon."